PCI Express serial communication board meets the new interface standard for expansion board. It is compatible with PCI Express x1, x2, x4, x8, and x16 lane Bus, enabling this board to be installed in any PCI Express capable PC system. Majority of today’s motherboard no longer come with serial ports or only have one port, with PCI Express serial board, users can add or expand 4 ports of serial interface on their system, allowing them to connect their serial devices. 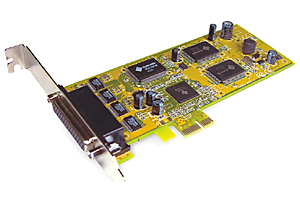 PCI Express Serial Board is the advanced and high efficient solution for commercial and industrial automation applications.